Paw Print Genetics - Do English cocker spaniels share any diseases in common with people? When you are a veterinarian living in a swirling haze of disease prevention and treatment, you often forget that most people don’t spend their spare time thinking about disease processes on a regular basis. They are even less likely to spend time comparing canine diseases to illness found in them or in people they know. Therefore, I suppose I shouldn’t be surprised when my friends, family and clients find it so fascinating and unbelievable when I tell them that dogs inherit and develop many of the same genetic diseases as people. In fact, dogs are well recognized in the scientific community as terrific models for particular diseases in people and have been thoroughly studied to gain information on many conditions. According to the Online Mendelian Inheritance in Animals (OMIA; http://omia.angis.org.au), as of this writing, there are 343 genetic mutations identified in dogs that are considered to be “potential models for human disease” and the list continues to grow rapidly since mapping of the full canine genome was completed in 2005. The mapped genome of a boxer named Tasha provided a much needed framework for genetic comparison studies between dogs and people. One such genetic disease, familial (hereditary) nephropathy (also called Alport syndrome in people), has been recognized in the English cocker spaniel since the late 1940s. In the 1980s, investigators identified that cocker spaniels affected with familial nephropathy showed similar microscopic changes in the kidneys as people affected by Alport syndrome (Potter and others 1985). In the 1990s, investigators identified that affected dogs showed a complete absence of two protein chains normally found in type IV collagen, the primary protein found in a part of the kidney called the basement membrane (Lees and others 1997). In 2007, the genetic cause of the condition (a mutation in the COL4A4 gene) in English cocker spaniels was elucidated by investigators at Texas A&M University (Davidson and others 2007). As suspected, mutations in the COL4A4 gene had previously been implicated as a cause of Alport syndrome in humans. Mutations in genes other than COL4A4 have also been associated with variations of the disease in both species. The changes in affected canine kidneys identified in the 1990s helped to explain the clinical features that veterinarians had previously seen in their four-legged familial nephropathy patients. The basement membrane plays important roles in normal kidney structure and proper filtration of urine from blood. Malformed type IV collagen leads to splitting and fragmentation of the basement membrane, thus allowing important proteins that would normally stay in the blood to be released into the urine. In addition, defective basement membrane collagen leads to early onset degradation of the membrane and chronic progressive kidney disease. Common signs of chronic kidney disease include increased urination and drinking, dehydration, weight loss, vomiting, anemia, oral ulceration, lack of appetite, and diarrhea. Familial nephropathy in English cocker spaniels normally presents around 4 to 8 months of age and most dogs succumb to the disease by two years of age. It is a recessive genetic disease meaning that affected dogs have to inherit two copies of the mutated COL4A4 gene (one from each parent) in order to develop the disease. 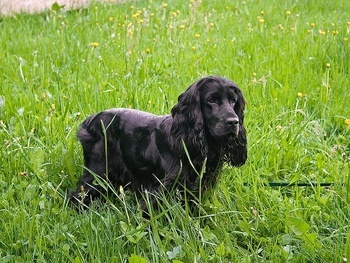 A major difference between affected humans and cocker spaniels is that people frequently have hearing loss and eye abnormalities associated with their condition that have not been associated with the form of the disease that cocker spaniels develop. There is no cure for this disease in either species, but feeding a high quality, protein restricted canine prescription diet specifically formulated for chronic kidney disease such as Royal Canin’s Renal LP or Renal MP may slow progression of the condition. All other treatments only treat the symptoms and don’t reduce the progression of disease. Therefore, genetic testing of breeding dogs is crucial in eliminating this disease. Because dogs with only one copy of the mutated causal gene are simply “carriers” of the trait and do not develop disease, it is possible to have affected puppies from a mating between two clinically unaffected carrier dogs. A mating between two carriers of this disease will result in approximately 25% of puppies being born with the condition, and about 50% would be born as carriers of the mutation and have the chance of passing the disease on to the next generation. Potter JS, McSporran KD, James MP. A suspected case of familial nephropathy in the Cocker Spaniel. N Z Vet J 1985;33:65–66. Lees GE, Wilson PD, Helman RG, Homco LD, Frey MS. Glomerular ultrastructural findings similar to hereditary nephritis in 4 English cocker spaniels. J Vet Intern Med. 1997 Mar-Apr;11(2):80-5. Davidson AG, Bell RJ, Lees GE, Kashtan CE, Davidson GS, Murphy KE. Genetic cause of autosomal recessive hereditary nephropathy in the English cocker spaniel. J Vet Intern Med 2007;21:394–40.